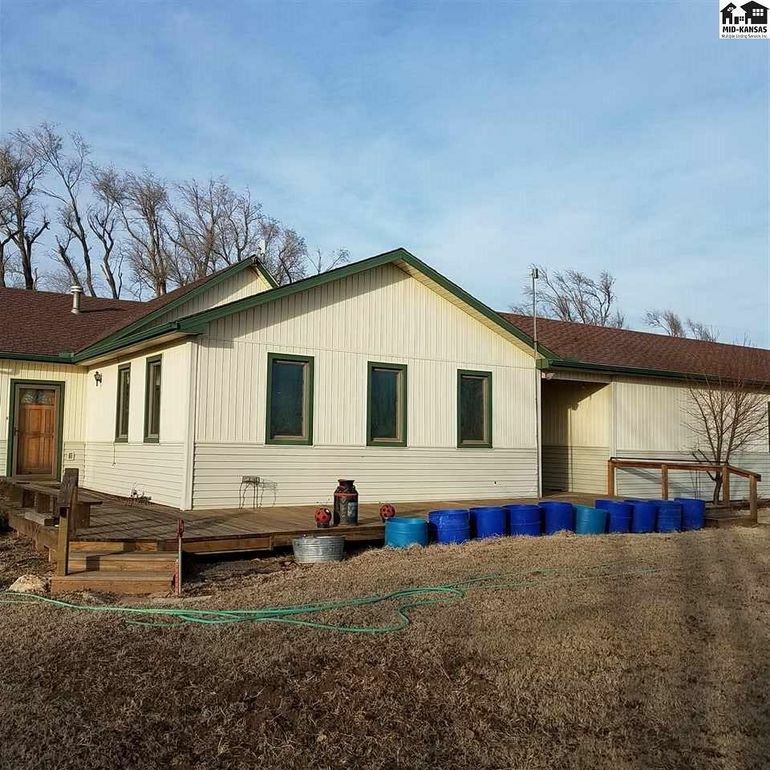 Contact Anita McQueen 6207275647 REMAX Premier, for showing .Harper Country property just 2 1/2 miles West of town, sitting on 2.8 ac with pond, 2400 sq ft round top, with automatic overhead door, 1600 sq ft barn, some fenced in area for farm animals, fenced in garden plot, on rural water, with well for pond and irrigation, spacious front entry has wall of large storage cabinets across from the front door, living room/ great room, with spiral stair case up to almost 300 sq ft loft, was used as playroom, could be office, or extra room, master bedroom has its own master bath included with large extra area for closet / dressing area included with sink in that nook,kitchen is awesome with cupboards that extend drawers out for easy access, lazy susan's in the corners, dishwasher and disposal, stove, microwave and refrigerator all stay with the property yes this is a 3 bedroom, 3 bath, main floor laundry beside one of main floor baths, washer dryer stay with property, partial finished basement even room for a kitchenette down there and family room plus bedroom, bath, utility, and lots of storage. Basement bedroom has access door to exit into the 3 car garage, with 3 automatic overhead door openers,complete with poured concrete floor and front access to it is concrete also. East door to home has entry from a wood deck extending into home and also garage. Beautiful mature trees enhance the finished yard. That pond, is complete with good sized fish. Directions: From Harper 2 miles West of 160 and 14 on 90th and 1/2 mile North on East side.